For this Blog Hop, our wrangler Jay Cassels, to "Unleash your inner Gleek and stand on the balcony and sing for forgiveness as you explore your relationship with Tarot and Music." I decided the best way to unleash my Inner Gleek was to go to the cards and pull out the cards that reminded me of songs, arrange them into a journey of sorts, and ask the cards for guidance on each of the songs. I used the standard RWS deck as my guide for each question and the Golden Rider for guidance. One of the most interesting things about this exercise was that for three of the songs, the song I was originally thinking of for each card turned out not to be the song that inspired my readings, the original song was simply a stepping stone to the song that had meaning and that I was meant to read on. As I googled lyrics, the songs that were meant to inspire me found their way onto my screen. I've included both the song I ended up reading on and the original song I'd chosen. Question: How can I take a leap of faith? The dashing Knight of Cups tells me that the time for protecting my heart is over. I need to open my heart and wear it on my sleeve. I need to be open to love and to the warmth it brings to me. I also need to be open to love coming in unexpected ways and through unexpected channels. The Knight of Cups also tells me that I might need to think about taking a quest to find the love I want instead of quietly waiting for it to come to me. The Seven of Wands tells me to believe in myself and what I want out of life. This is not the time to slink of quietly into the night. It is the time to stand firm and believe that what I want will come to me. This is not a card about physical aggression or about looking for a fight, instead it is a card about believing in myself and knowing that I am worthy. The Hermit tells me that all the knowledge I need is within my own soul. I need to take time for myself and take time to listen to the wisdom of my heart. I need to calm the chatter and to trust that my heart is wise and right. I also need to be a beacon of hope for others in how I live my life. However, this is not telling me to go out and seek students or actively live my life for others. It is simply telling me that the way I live my life will inspire others. All told, this was very good advice on how to take a leap of faith and trust that the universe will catch me. I think the thing that we sometimes forget is that taking a leap of faith doesn't mean going into the wilderness unprepared, it means taking time to prepare and when you are ready taking a leap of faith. Question: How do I love Again? The Ace of Wands lights the way to new love and reminds me that I am a child of divinity who is creative and inventive. The Ace is telling me to focus on my own creativity and not worry too much about love. I have set my intentions and prepared for the journey and done everything I could before taking the leap of faith. Now I just need to live my life and know that good things will come to me. The next two cards, the ten and nine of swords, would seem to be negative cards in this reading, but I'm realizing that they are not. The Ten of Swords is telling me that my heart has been broken and that there will be no pain that will be worth than what I have endured. I have survived this pain and I will survive any thing else that comes my way. The Ten of Swords is also a reminder not to be a martyr, but to get up and be a survivor. And the nightmare card, the Nine of Swords, says it is my own fears keeping me from loving again and not anything concrete. The Nine is also reminding me that there is a certain element of faith to anything that happens in this world and that I need to let go and quit beating myself up. Question: What am I sailing toward? The World tells me I'm sailing toward my own self completion and being content within my own skin. I'm sailing toward liberation and letting go of the past. This is critical for me right now as I'm coming out of a period of letting go of old lessons and hold hurts. The World is a reminder that I am good enough and that I am complete and whole into myself. The Queen of Pentacles is a reminder that I am loved and that the universe contains all that I need. Even though my own mother did not provide me with the firm foundation I needed, the Queen of Pentacles and the Goddess herself will provide for me. They will nurture me and love me and provide for my needs. The Queen of Pentacles is all about security and about knowing that there are people in my life who are there for me. The Knight of Pentacles tells me that I am sailing toward people who will be there and who are trustworthy. I'm leaving behind people who are flaky and unreliable and moving toward a world with people who care about me and are there for me. I am sailing toward reliability. Question: What do I have to celebrate in my life? 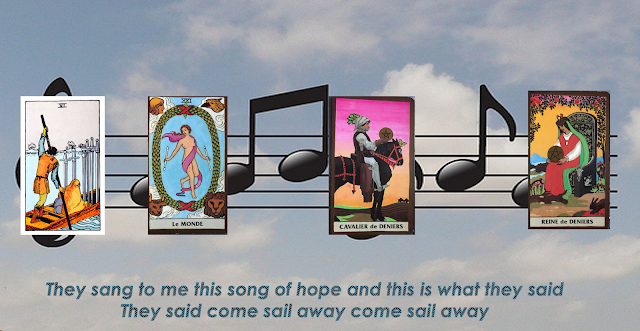 The Six of Swords tell me that I get to celebrate moving on and leaving my past behind. I have worked hard to let go of the things and people that are holding me back and that is something I should definitely celebrate. It has been a lot of hard work, but it is paying off and I am becoming the person I was meant to be. Although the Seven of Pentacles would seem to be an odd card for a celebration, it is the celebration of the stillness and the ability and willingness to take a pause. I am a recovering drama addict and even today there are times when my mind would rather be feasting on drama versus stillness. The Seven of Pentacles reminds me of how far I have come and that I can relish peace and quiet. Buying a house has really taught me patience as I've realized that I do not have the time and money to fix the entire house at once. I have to be patient and do things as I have time and money. Life has its ups and downs as the Wheel of Fortune reminds me. Sometimes life is amazing and wonderful and other times it is not. The WoF tells me that I should celebrate life in all its glory. I need to be grateful for all the good things that come into my life. The WoF also tells me that in the short term, good things are coming my way. Question: What are the lessons of the sun? The Magician tells me that I have the power to manifest my own destiny. All the tools that I need are at my finger tips, I just need to choose to utilize them. The Magician also tells me that I am a channel for power and that I must respect that channel and not take it for granted. The Eight of Wands is about taking action quickly and not about analysis by paralysis. The Eight of Wands also tells me there is a possibility of a love connection with someone I know or with someone who is just coming into my life. The Three of Cups tells me to celebrate the goodness and wonder in life. It is time to put aside the worry that is weighing me down and raise a cup to the goodness of life. I deserve to have happiness in my life and I deserve to know that I matter. I know from experience that even though sometimes it seems that keeping our nose to the grindstone is the right course of action, taking time to celebrate can often feed our souls and make us that much more productive when we do go back to work. Although I had my doubts when I first read this prompt as to whether or or not I could do it justice, my guides came through for me and guided me to a reading that made sense for me. Use the links below to navigate to the previous blog, the master list, or the next blog. Really clever exercise! It's interesting to see the song you started with and where you ended up. At the moment, me and my wife are making up for not being able to afford home repairs and improvements for the last fifteen years. Yes, it is a lesson in patience--and budget juggling--as we try to figure out what we can afford to do, and what can wait other day. My goodness, this made me think--lots of deep philosophical journeying here! Thanks for letting me come along!